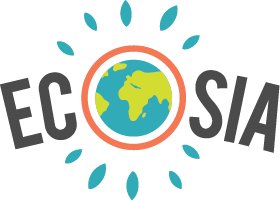 Does Ecosia have a newsletter or a blog? How can I support Ecosia? How can I convert my school, university, company or organisation to Ecosia? How can I integrate an Ecosia search bar or banner into my website? If you would like to do even more, here are some tips on how to get Ecosia installed at your university, company or organisation. You can also check out our new online store! We plant 20 trees for every t-shirt sold, with 80% of our profits going towards our reforestation projects worldwide. We currently don't accept donations and can’t offer volunteer tree-planting trips or short-term internships, but if you should be interested in supporting our reforestation partners in any way, they will be glad to hear from you directly. For more updates, events and news, follow us on Instagram, Twitter, Facebook and Youtube. How does Ecosia make money?